BBQ Silicone Brush, BBQ SILICONE CLEANING BRUSH, SILENT, HEAT AND FREEZE RESISTANT, ECO FRIENDLY, USED FOR BBQ, BUTTER, CHEESE, ETC. 1. anti-slip, fashion wave designed. 3. Withstand extrem high and low temperature. 4. water and oil resistant, easy to clean. 4. water and oil resistant. 3. Withstand -40 to 230 cels degrees. 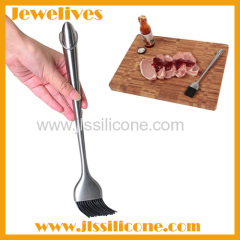 Group of Silicone Brush has been presented above, want more	Silicone Brush and SILICONE GRILL BRUSH, FOOD SAFE SILICONE BRUSH, TOAST BRUSH, Please Contact Us.